Provide necessary supports to autistic children for their empowerment as full-fledged member of the society, said Social Welfare Minister Enamul Hag Mustafa Shaheed yesterday. Speaking as chief guest at a conference, he said steps will have to be taken for their inclusion in the mainstream society. 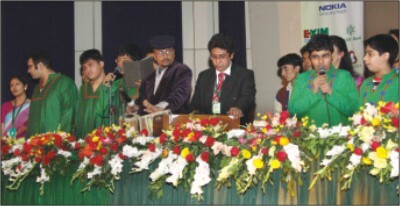 The third South Asian Regional Conference on Autism 2009 was organised by the Society for the Welfare of Autistic Children (SWAC) at the social services department auditorium in the city. The minister underscored the need for raising awareness among the people about autism and its consequences. He said the government and non-government organisations should work together to help autistic children and their families. �As a new government we have plans to build up these children as skilled and efficient manpower so that they can come forward from their backwardness through training and introducing sign and visual languages for them,� said the minister. Shaheed said his ministry would welcome any proposal on the rehabilitation of the autistic children to be drawn at this conference. He hoped that the conference would help create a better awareness about autism and would be able to generate a favourable response to the issue in this region. �Social welfare ministry is trying to provide necessary support and relevant programmes for these children with special needs to make their lives comfortable and liveable,� said Dewan Zakir Hossain, secretary to the ministry. He also aspired to ensure a life of dignity and prestige for these children in the society. National Professor MR Khan urged the healthcare centres to treat and handle these challenged children with special care, and said educational institutions for autistic children should not be centralised in the capital only. Sharing his experience, Qazi Fazli Azeem, an autism awareness activist, lecturer and trainer from Pakistan, laid emphasis on the role of media to raise awareness among the people about this burning issue. �If media addresses the issue adequately, people would be motivated to work together to resolve this common problem of South Asian region,� said Qazi Fazli, an autistic person who has recovered from his lacking. While talking to The Daily Star Merry Barua, an autism awareness activist from India, focused on the need for inviting foreign experts to train up the parents, doctors, teachers and counsellors for better management of autism in the country. She said the geographical compactness of Bangladesh can help spread awareness about autism quickly among the common people and take effective measures. She said Saarc may take a combined plan on autism, and this kind of regional conference can create a platform to work together to overcome the problem. �It is not always possible for the parents to bear the educational expenses of their autistic children in private institutions,� said Ferdous Ara Lovely, a mother of an autistic child. She urged the government to provide land and funds for these children. Echoing her voice a group of parents who attended the conference also urged the government to train up the parents so that they can detect the problem of their children at an early stage and can take remedial measures. They also called for a resolution for social acceptance of the autistic children. Chairman of Brac Bank Ltd Md A Ali, Director General of social services department Hedayetullah Al Mamoon, Managing Director of Nokia Prem Prakash Chand, Managing Director of Jatiya Pratibandhi Unnayan Foundation Monsur Ahmed Chowdhuri also spoke at the programme.